Giveaway. 3 lucky winners will win a great snack package. is The Popcorn Factory. Let’s take a look at these great prize packages. 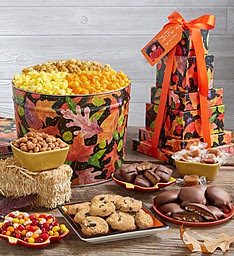 A great way to provide gourmet delights for a gathering of friends and family, our 7-tier Fall Colors Tin & Tower offers a medley of seasonal treats and a trio of popcorn favorites. 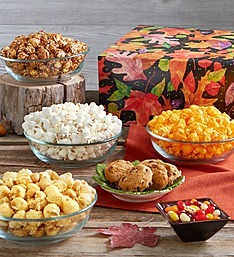 A sampling of mouthwatering goodness, our Fall Colors Sampler is the perfect way to send someone special a tasting of gourmet popcorn and seasonal treats.